Good morning! I hope you had a terrific weekend! Today's video is based on a card I created for the book Interactive Cards 2 from Annie's. I use the one basket image from Holiday Basket to make both the lidded basket and the pop up element inside. Clear stamps make creating this "new image" for the front so easy. I love the modification, and transitions so well to the pop up reveal of the flowers inside. For today's demo I use the roses from the set instead of the daisies in the coordinating Spring Basket set. This design would be terrific for a birthday, or upcoming Easter or Mother's Day card. Celebrate sentiment is from Theresa's Celebrate the Season and greeting inside is also from Holiday Basket. Score 1 1/4" by 4 1/2" pop up strip at 1" 2", 3" and 4". 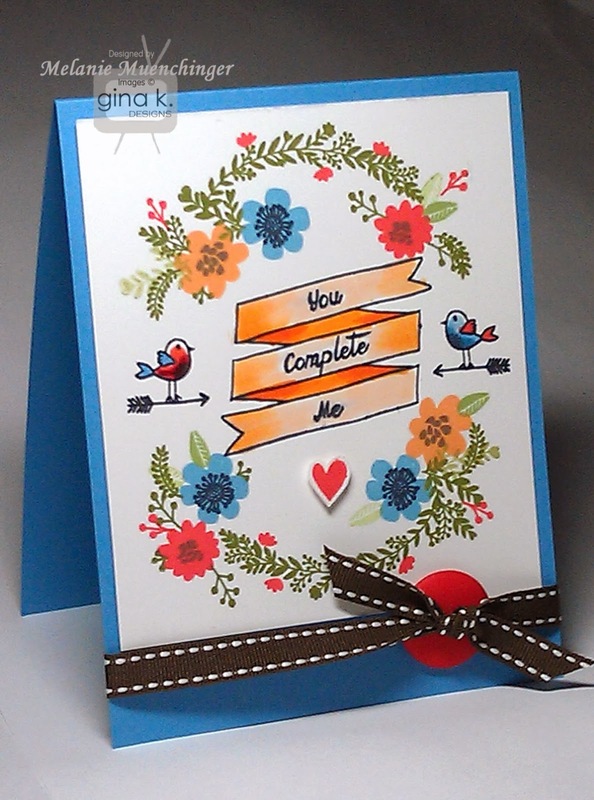 You can find this and three more projects from me using stamps from Gina K. Designs in Interactive Cards 2. Hello! I hope you had a wonderful weekend! Today’s video shows how easy it is to create patterns with the stamping off technique and my Pretty Patterns 2 set. I haven't used this tile pattern as often as some of the other borders in the set for my samples for you so far, but I love the ombre effect you can make and how clean that looks with the white space in between! With all those squares, it looks like a lot more than it really is. I also use my Lots of Letters set to spell out a sentiment on the stair steps created from stamping on a diagonal. This bright graphic CAS card uses minimal supplies, can be made quickly and can be adapted to any occasion or color palette, working for male or female. In the video I switch from this birthday design to a baby card. Please enjoy! 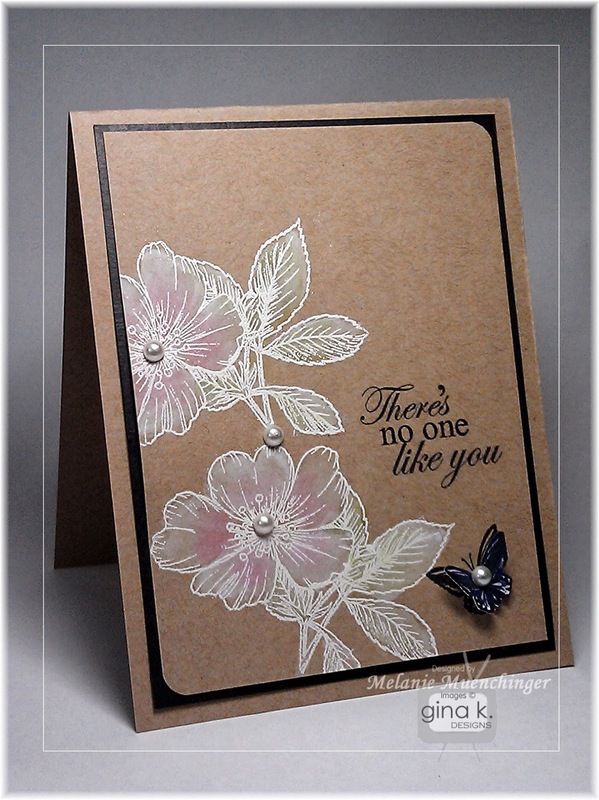 This video demonstrates a reverse masking sponged background using my Branching Out set with the new Shabby Spring StampTV kit. You will love the versatility and ease of this dramatic technique for your clean and simple projects. The bird image nests perfectly into the frame stamp’s branches. Update: Stately Flowers 8 is out of stock! I am of course thrilled there has been such a positive response to it and the new videos, but I apologize we don't have it currently for you to add to the cart. Please keep it on your wishlist as we will be getting more added to the store in *just a few weeks*. :) I will go through my stamp catalog and suggest some other sets I've included butterfly images in that will work well with this technique in the meantime. Thanks for your patience! 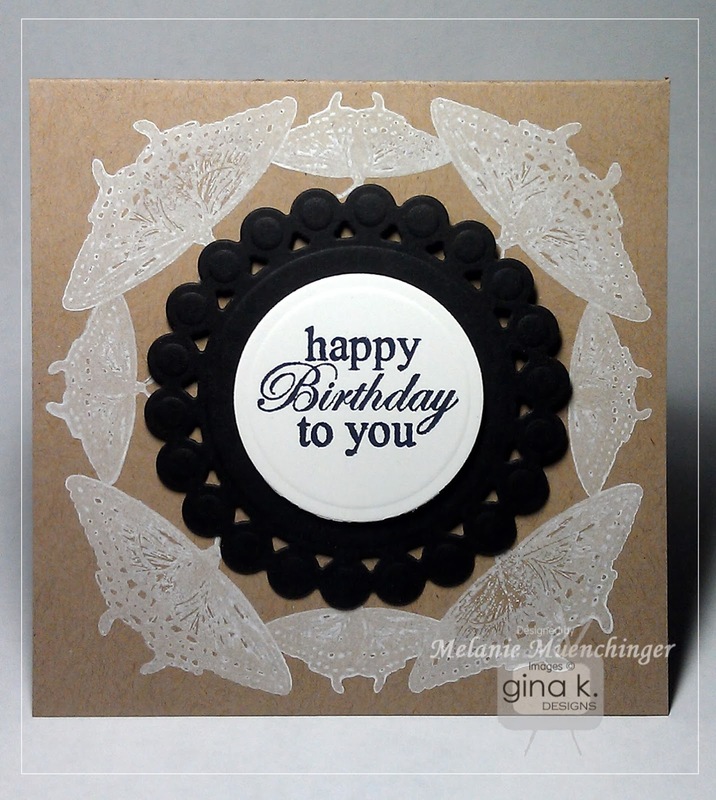 Today I am using both butterflies from Stately Flowers 8 to create a stamped doily. This video shows a simple trick for getting a symmetrical design on your card. 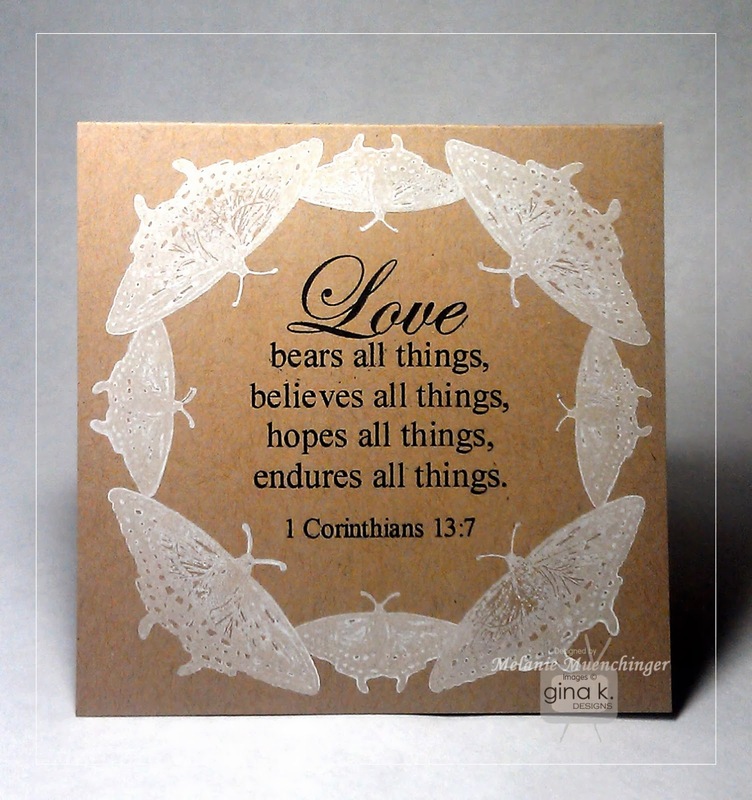 This doily design is wonderful for framing up a sentiment of a stamped image. Substitute a square or octagon die/template to create pendants rather than a "round" doily shapes. something round to use a guide. Approximately 2 1/4"
Here is the variation I also showed centering some layered die cuts inside. 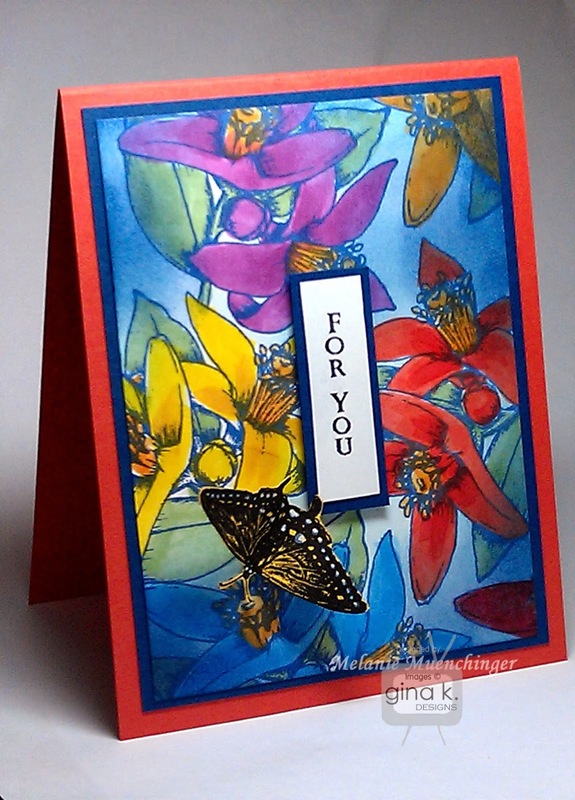 The large and small butterflies in my Stately Flowers 4 would also work well for this technique and design. Stately Flowers 4 is a clear set and has some gorgeous florals for spring and summer! 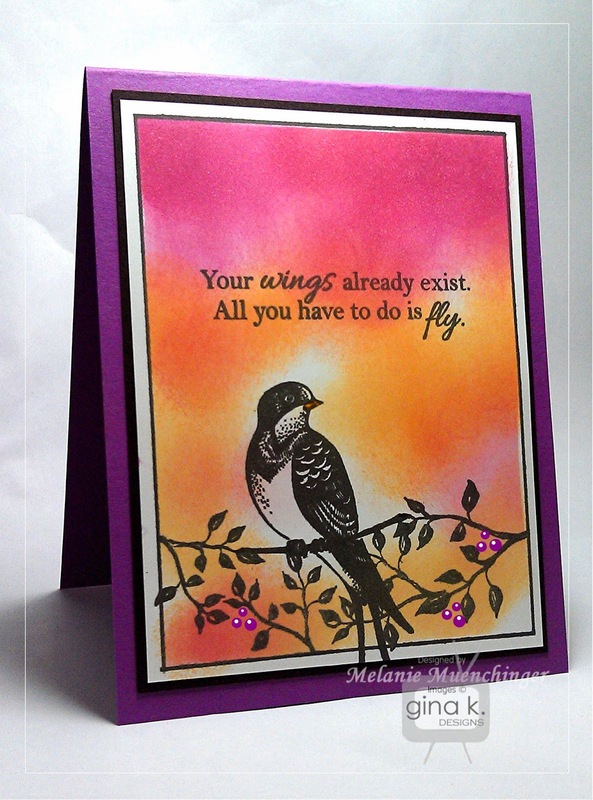 Today I have a card I made using Becky Oehler's new Folk Filigree set. This includes tons of tiny bold flower elements, plus some banners and birds for those of you who like coloring. Get your ink pads ready! I started with the banner in the middle with the intention of creating some floral garlands around it, and it just evolved form there. As you can see, I did not make it perfectly symmetrical, but I did stamp opposite parts of the design as I went to keep it balanced. First, the semicircle garland above and below. Then I added the larger flowers, then two-stepped the flower centers, then eventually filling the mat out with springs and berries and smaller flowers until I was pleased with the look. I perched the birdies on either sides on the arrow and popped up the little heart. Cardstock is Pure Luxury Powder Blue and White, button is from Gina K Color Companions Bowl of cherries and Dark Chocolate stitched ribbon. Ink pads are Gina K Color Companion Red Hot, Powder Blue, Fresh Asparagus, Grass Green, Dark Chocolate, and Sweet Mango. Good morning! Today I am sharing how to get a beautiful whitewashed look with just a subtle hint of color in this technique video "Whitewash". Isn't that divine on this wild prairie rose? This technique is so gorgeous on all my stately flowers! No markers today, just a white and some colored pads. I *know* you have colored pads, but you can use your colored pencils for adding color, too. Good morning! So I started stamping these orange blossoms from Stately Flowers 8 in blue on a white panel intending to make a monochromatic card, but... I just wasn't feeling it. Time to grab some bright markers ! RV19, Y38, Y19, R17 and B18. I collage stamp floral backgrounds all the time but I don't believe I've ever colored them all different colors on one panel! No shading here. Solid green (G24) on the leaves. Finally, sponge some Blue Denim ink around the flowers, and the result is something like a Hawaiian shirt, no? It's funny how this small vertical sentiment from the set (stamped in Black Onyx on white and matted with Blue Denim) can be the focal point, but I love how it lets so much of the background show. I stamped the butterfly in Black Onyx on Wild Dandelion cardstock so the yellow would show through and then added some dots of white with a marker. Pop up on a foam square and that's it! Base is Pure Luxury Tomato Soup and mat is Blue Denim. 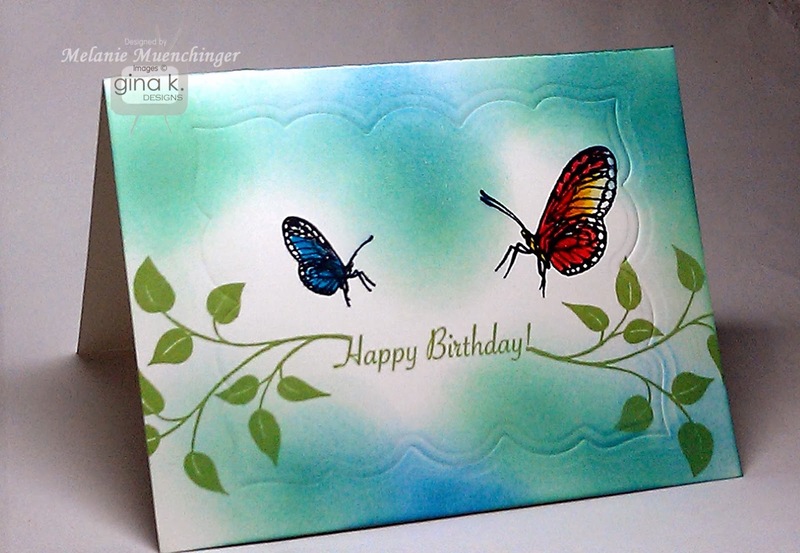 Today I have a single layer card I made using Theresa Momber's Signs of Spring. I loved these leafy sprigs and thought it would be fun to create a single layer scene on Pure Luxury White base, connecting the greeting with the branches in the middle. Start by stamping the greeting to have it centered, and then add your branch just touching the top and bottom the sentiment on either side. The clear stamps make this easy. :) Stamp your butterflies above in Black Onyx and color with Copics. Add a bit of sparkle with colored glitter pens. Finally, sponge some Ocean Mist and Turquoise Sea randomly, leaving white space, to make a cloudy background. 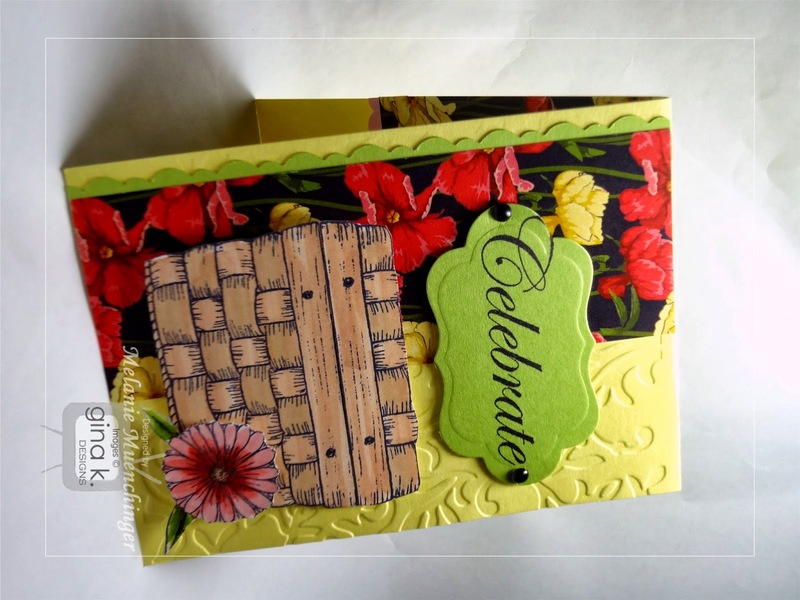 I used a Nestabilities die to emboss a shape to frame the scene and add a "layer".